Wow time goes by so fast these days. I am behind 5 brewery reviews, 4 beer related stories and 3 other sub beer stories what and where shall I start first? 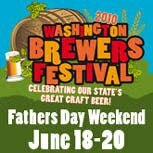 How about this weekend the Washington Brewers Festival is coming up and I am excited to be attending. This will be my 4th year of attendance and every year it seems as thought the beers increase and more and more brewers show up. If you have not been this is quite the event. Be ready for any type of weather Kenmore, WA can be unpredictable. I have been when it is a cold wet March like day. Or go back to the second year I attended and it was hot August roasting. There is a great line up of brews and if you’re in the area Friday night is going to be truly a big event. All special brews from Washington Brewers only this will prove to be a must go to. Note Friday is for 21 and over. The other days your kids are welcome and there are kid play areas. I for one am excited as I’m volunteering for the first time to help pour. I have poured at many other events but not the Big Fathers day festival. Come by and say howdy as I pour some awesome brews. Later I will be hitting the libations myself and hoping to be sipping some truly awesome beers. I have my list ready of what I am seeking to try. Washington Brewers Festival 2010 is in 2 days. Full details soon to follow.